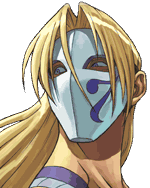 Click here for more information about Vega's other fighting game appearances. Vega became a high-ranking henchman for M. Bison in Shadowloo purely on the promise that he would be able to reap his special brand of torture with abandoned delight. Put in charge of Shadowloo's various assassination missions, Vega was never told how to do his job because Bison knew he relished every exquisite pain he inflicted on his targets, and he never failed to find and assassinate them in some artistic fashion. Bison always admired Vega's creativity, but he valued Vega's loyalty even more. When it turned out that someone dared to sponsor the second Street Fighter EX tournament in Bison's place, he suspected that it might actually be a trap to lure Bison out into the open, having narrowly escaped capture by the US Air Force and Interpol at the end of the last tournament. Bison sent Vega ahead to scout the situation out, which Vega was only too happy to do, although he wasn't thrilled about being sent to the tournament with an ugly brute like Cracker Jack. When Vega arrived, he did some research and noted a lot of interesting connections between some of the contestants. Many were long time companions, and some were even family members. He happened to be pit in a match with the beautiful Hokuto. Prizing beauty above everything else, Vega felt that Hokuto was a very worthy opponent for himself. He noticed as he began to fight her that she was struggling with something inside her mind. It became a game to Vega to force Hokuto's focus off whatever she was concerned with holding back. He used his claws to inflict painful slashes along Hokuto's body. Eventually, Vega succeeded in breaking Hokuto's concentration and she was driven mad by a special kind of darkness that consumed her. Knowing that Hokuto was scheduled to fight against the very man she came to the competition with, Vega thought how delightful it would be to watch one friend be struck down by this possessed woman. He threw the match, and allowed Hokuto to advance. Vega relished every moment of the next fight between Hokuto and her lover; the look on his face when he realized she didn't recognize him, the final strike when she inflicted a mortal wound on him, and the look of horror on her face when she woke up and realized what she had done. It could only have been better if Vega had killed the man himself. His work done, he reported to M. Bison everything he had learned and let him take it from there. 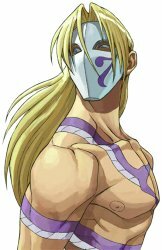 Vega joined the third tournament as M. Bison's partner, although he was instructed by Bison to perform several covert spying operations for him, to learn more about Shadow Geist and other potential threats to Bison's life. This page was last edited on 15 January 2008, at 19:35. This page has been accessed 18,416 times.